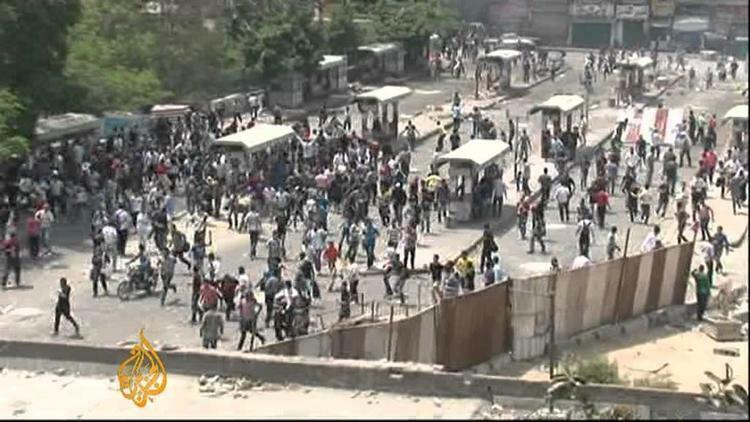 Thugs, very possibly backed by the continued military dictatorship in Egypt, attacked protesters at dawn on Wednesday in front of the Ministry of Defense in al-Abbasiya, Cairo, leaving some 20 dead. The protesters suspect that they were actually plainsclothes police. The 500 or so protesters had been gathered to object to the disqualification of their favored candidate, Salah Abu Ismail, a Muslim fundamentalist favored by many of the Salafis. Some of the protesters were leftist youth activists, from “April 6” and other such organizations, who want an end to military rule and a handover of power to the parliament. Their assailants have not been identified. As a result of the deaths, both fundamentalist and liberal parties cancelled a planned meeting with the officers, who still form a collective interim presidency in Egypt. Likewise, several of the presidential candidates suspended their campaigns. Muhammad Mursi, the candidate of the Muslim Brotherhood, however, said that it would be unacceptable for the military to postpone the May 23 presidential election or to delay returning to the barracks once Egypt has a civilian president. The reformist Muslim, Abd al-Moneim Aboul Futouh, called on parliament to demand from the interim minister of defense that he intervene to protect people who were merely exercising their right to public protest. The secular, liberal candidate, Amr Moussa, warned the public against getting too caught up in a single such incident, and urged that the country move forward with its political process. He demanded that the military issue an unambiguous promise to step down once a president is elected. There have been several such unfortunate instances of bloodshed by unidentified thugs, suspected of ties to the officers or to remnants of the old Mubarak regime, over the past year. None has derailed the political process, however, since the revolutionaries and the general public want elected leaders to take charge. Egypt’s presidential elections will almost certainly get back under way after a decent interval. In the meantime, big demonstrations at Tahrir Square in downtown Cairo and elsewhere in Egypt were planned for Thursday and Friday to demand punishment of the killers and to demand a quicker move to democracy.